In less than one week, the Classic TT is going to take place on the Isle of Man (IOM). For those who love the Classics, this is “the” TT although the one in June is also freaking to watch. In any cases, if you love the sounds of the old racers, this is the place to be but whatever you go or not, here is a film to discover or rediscover, that put you straight into the ambiance. 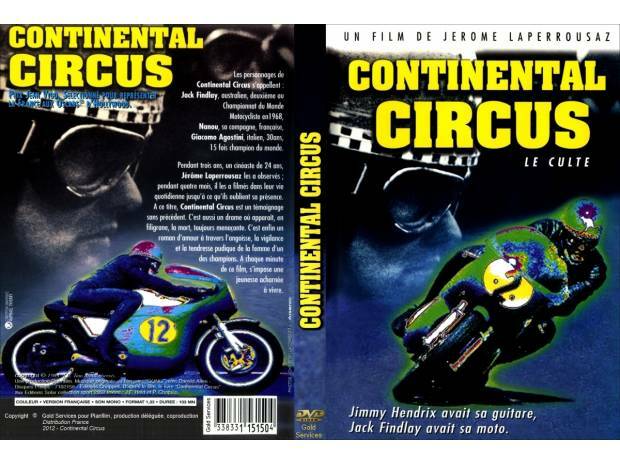 I posted several links related to the film “Continental Circus”: the integral and seven shorter sections for each the Grand Prix. Laperrousaz produced this movie in 1971. It is a documentary so no fancy story but fantastic images from the past that is not so far away. All the legends are there, Ago, Hailwood, Read, Pasolini… If you love classic motorcycles, you are going to love it, if you appreciate moderately the old documentary stuff, that’s OK too, but make sure that you look at least the first clip which is a tribute to all the pilots who paid their passion cash with their own life. The first four minutes are pretty hard and emotional, reminding us of the poor safety conditions in racing at that time. Don’t miss neither Jack Findlay in the windshield of his Norton Manx from 4:43, this is divine! Part 3/7: “The Assen Grand Prix in 1970: : this is in fact the 1969 (!) 350 race, with Bill Ivy taking part! Bill sadly had a fatal accident at the Sachsenring later that year. I have not yet seen the other parts.